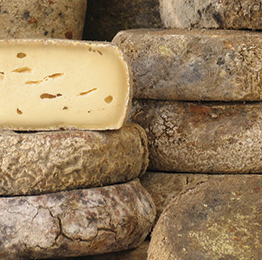 Spanish cheese has a long tradition of locally made, artisanal production. But until the late 1990s and early years of the 21st century, very few great Spanish cheeses were imported into the U.S.. They simply were not available for export. So American cheese lovers are now finally discovering just how wonderful these cheeses are. Name-control or Denominación de Origen Protegida (D.O.P.) laws were first established in Spain in 1981 when Roncal was awarded the prestigious designation. Cow's milk cheeses exist of course, but they are less widely known. A D.O.P. Spanish cheese is more likely to be found in an American cheese shop. D.O.P. Cabrales is the most famous Blue Spanish cheese and stands up well in comparison to widely known Blues like Stilton, Roquefort, Fourme d'Ambert and Gorgonzola. Once upon a time, Cabrales was wrapped in leaves; sadly that is no longer true - you will find it in the cheese shop wrapped in foil. Be sure to look for the Cabrales logo stamped on the foil. Cabrales is widely available in the U.S. so give it a try if you have not already done so. The cheeses are made in discs about 3 inches high and 7-8 inches in diameter. It has a strong aroma and the flavor is no shrinking violet either! A ripe Farmhouse Cabrales will have a fine texture, crumbly, slightly salty, with uniform deeply blue (almost purple) veining throughout. Traditionally it was made from a mixture of cow's, sheep's and goat's milk, but today it is usually made just from raw cow's milk. If you can find a mixed-milk Cabrales, you will be in for a treat! The animals graze in the lush,high mountain pastures found in N.W. Spain, so the cheese made in spring and summer will reflect this distinctive terroir. Therefore, look for it in the cheese shop in late fall through winter for the best flavor. Like Roquefort, Cabrales is aged in limestone caves for at least 2 months, and up to 6 months. Cabrales is, however, less wet and sticky than Roquefort. The more aged versions are really terribly strong and best avoided unless you go for a really pungent, eye-watering experience. D.O.P. Garrotxa is a semi-soft Spanish cheese made from pasteurized goat's milk, and a really fine goat cheese it is! The very thin, bloomy rind is grey and fuzzy and the interior white paste is typically crumbly, with a smooth, cake-like texture. The flavor is not strong; rather it is mild and tangy with lovely nuances of flowers, herbs and grass, reflecting the Mediterranean coast terroir. Garrotxa is made in the N.E. region of Catalonia and both raw and pasteurized milk versions can be found. Usually it is aged for a minimum of twenty days in caves, after a brief bath in salt brine. Although Garrotxa had been made for centuries, it nearly died out altogether. 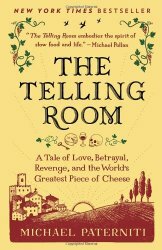 It is only recently that artisanal cheesemakers have revived the original recipe. Garrotxa has achieved pre-eminence quickly and deservedly so. Blancfort is the best brand to select. Another semi-soft, pasteurized goat's milk cheese is D.O.P. Queso de Murcia al Vino, also known as Drunken Goat Cheese. The Spanish words literally mean "washed with wine" - that is, the local red wines, Yecla or Jumilla. 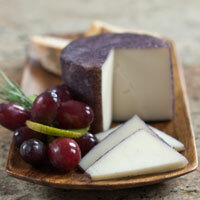 As you might expect, the rind turns violet-red in color and the cheese exudes a grapey aroma. But the interior paste remains white, speckled with small eyes, mild, sweet, slightly salty in flavor. This is a simple, easy-to-eat cheese that you will enjoy introducing to your friends. The D.O.P. regulations require that Queso de Murcia al Vino must be made from the milk of Murcian goats, along the S.E. coast of Spain. Both a fresh (fresco) and an aged (curado) version are available. This is a Spanish cheese you must try! Made from the rich, raw milk of free-grazing sheep (Serra da Arrabida) in Portugal, P.D.O. Azeitão is a semi-soft cheese best consumed at about 3 months when it is soft in texture. When properly ripened this cheese will achieve a melting, oozing consistency. If brought to room temperature, you can slice off the top of the cheese and scoop out the paste with a spoon. The cheese is coagulated with cardoon thistle, as opposed to rennet, so that the flavors are vegetal, herbal and slightly sour. The cheese is brine-washed and ripened for a minimum of 60 days. If you have not tried a cheese coagulated with thistle, you must try Azeitão! A wonderful sheep's milk, semi-hard Spanish cheese from the Basque country and Navarre in Northern Spain - D.O.P. Idiazábal can only be made from the raw milk of Latxa or Carrazana sheep. Usually produced as a smoked cheese - a tradition dating back to shepherds who made the cheese in their mountain huts and hung the cheeses by their chimneys - it is also made in a non-smoked version. Produced in 5-6 inch thick wheels with a diameter of 5-7 inches, the finished wheels weight 5 to 9 lbs. During production it is salted in brine for 2 days and then ripened for 2 to 6 months. Idiazábal is very popular in Spain and now in the U.S.. It is a firm cheese, slightly dry and a bit oily to the taste (in a good way) with a nutty flavor. The interior should be pale yellow with a sprinkling of small eyes; the rind is yellow to a sort of orange-brown. 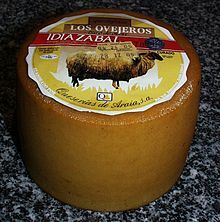 Idiazábal is a very high quality cheese which I strongly recommend that you try. D.O.P. La Serena is a fun Spanish cheese (known as a "torta-style cheese") to serve at a wine and cheese party. It is a sheep's milk semi-soft cheese produced in the Extremadura region of S.W. Spain and regulations require that only milk from the Merino sheep be used. Merino sheep produce fine wool (Merino sweaters! ), but they are also known for their very rich milk. The cheesemakers coagulate the milk using an extract of dried wild cardoon thistle which imparts just a hint of bitterness to the cheese. They form the cheese into molds made from grass baskets or plastic facsimiles, and then age the cheese for a minimum of 2 months. Either pasturized or raw milk may be used. The end result is a fantastic cheese which is both very expensive and highly treasured in Spain. The traditional way to serve La Serena is to slice off the top of a fully ripe cheese and scoop out the pudding-like paste onto crusty pieces of bread. It could be one of the centerpieces of your cheese table! The cheese will be very rich, buttery and tangy. The wheels are made in 2 and 4 lb. sizes with a yellow rind which will bulge at the sides. The interior should be ivory in color and as it ages it will become more golden in color. There are scattered eyes throughout. La Serena is considered a real delicacy. Be sure to try it! For many years D.O.P. Manchego was the only Spanish cheese most Americans were familiar with. It is produced in the La Mancha region in the arid interior of Spain, from the milk of the region's Manchega sheep. You will often see a cross-hatch pattern on the thick, waxed rind and that is because it is formed in grass baskets or plastic facsimiles, like La Serena cheese. Young, fresh Manchego is aged for at least 2 months while the aged or "curado" Manchego is aged for 9-12 months. There is even a version which is bathed in olive oil. Manchego has been well-known and loved in Spain for a long time; in fact, Cervantes even mentioned the cheese in his Don Quixote of La Mancha. All Manchego cheese has a mild flavor, with a semi- dry texture. The interior paste has a sprinkling of small eyes and its color can range from white to off-white to yellow, depending upon its age. It is not the most interesting of cheeses - you would probably enjoy and even prefer similar, but more flavorful cheeses such as Roncal or Zamorano, both of which I present in this section. 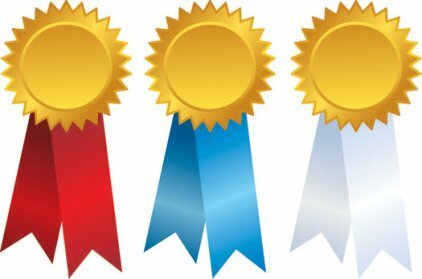 Read which Manchego cheeese won the The Best Cheese in the World title at the 2012 World Cheese Awards! If you can find an artisanal, small production D.O.P. Manchego (such as Pasamontes), by all means buy it...it will be of much higher quality and flavor than the mass-produced versions we so often see in this country. D.O.P. Mahón is an ancient cow's milk Spanish cheese dating back perhaps as long as 3,000 years. Unlike most other cheeses, Mahón is formed into 8 inch, 5 lb. squares, sort of like a puffy cushion. In fact it is wrapped in cloth while it is pressed, thus creating nooks and crannies in the rind which capture the salt and terroir aromas on the island of Minorca, off the east coast of Spain, where it is made. It is then brined in salt and aged in underground caves for 10 days up to 10 months...thus there are a number of versions of Mahón available, depending upon its age. Cheese aged over one month is rubbed with butter, olive oil and/or paprika. The color of the rind will therefore vary from yellow to orange-brown, depending on the substance with which it is rubbed. As with all cheeses, flavors intensify with age, but typically the flavor of Mahón will be a little salty and acidic, with buttery undertones. Although the texture is hard and crumbly, you will find that it melts smoothly on your palate. There are about 600 small farms and artisan cheesemakers on Minorca which make Mahón. So look for the D.O.P. designation and you can be sure of a quality Spanish cheese. Click the the link below to order your copy today! Long ago in Medieval times, the population of the Roncal Valley villages grouped together as a society, raising sheep, lambs and horses. The valley is in Northern Spain, bordering on Basque country. During the spring and summer the herds of sheep were tended throughout the mountains and the people traded their products (cheese, milk, meat and wool) in nearby Pamplona. This was how D.O.P. Roncal cheese became so famous. Flash forward to 1981 and Roncal became the first cheese awarded the D.O.P. designation in Spain. Today the Roncal Valley population still oversees its natural resources, including the traditional manufacture of its Roncal cheese, through local cheese dairies and factories. It is a firm sheep's milk cheese, made from the raw milk of the Latxa and/or Aragonesa Rasa sheep. Formed in wheels about 6 to 7 inches in diameter and weighing 5-7 lbs, they are rustic-looking rounds of cheese, with a homemade appearance. It is somewhat similar to Idiozábal. The cheese has a sweet, nutty flavor, and the texture is firm, moist and smooth. The paste is beige to almost amber in color, while the rind can vary from reddish brown to dark grey. You can sometimes see the sheen of butterfat on the cheese and this is perfectly normal. The cheese is aged for a minimum of 4 months. Two excellent brands to look for are Esca and Lara. The region of Castile-León in western Spain lies along the border of Portugal. D.O.P. Zamorano is made only in the province of Zamora, from the milk of the Churra breed of sheep. It is very similar to Manchego and most experts and cheese lovers seem to agree that it is a far better cheese. Buy a small piece of Zamorano and a small piece of Manchego and compare for yourself. Zamorano is a firm cheese; its rind boasts a cross-hatch pattern from grass-matted molds, along with the impression of a wheat-ear on both top and bottom - from the presses. A full wheel is very distinctive in appearance! The artisanal cheesemakers rub the rind with olive oil and age the cheese for a minimum of 100 days in caves. The paste is firm with a creamy, nutty flavor. Zamorano is a treasured delicacy in Spain and here in the USA.